Unit 3, Block 1, Lot 3; TOT ID# 1644 Sea Rock offers casual sophistication at it's best. 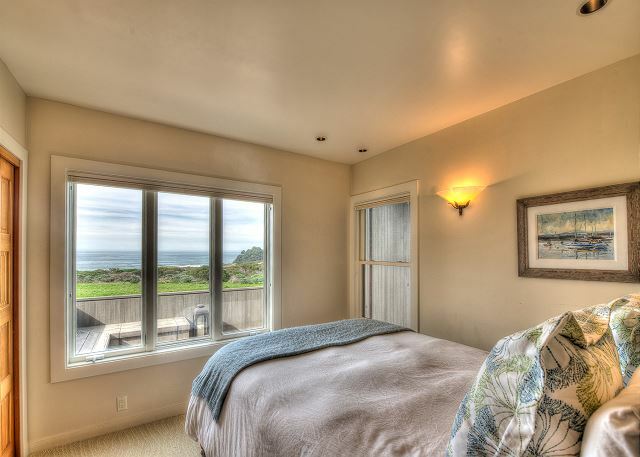 Located approximately 100 yards from the ocean front with unobstructed ocean views from every room. 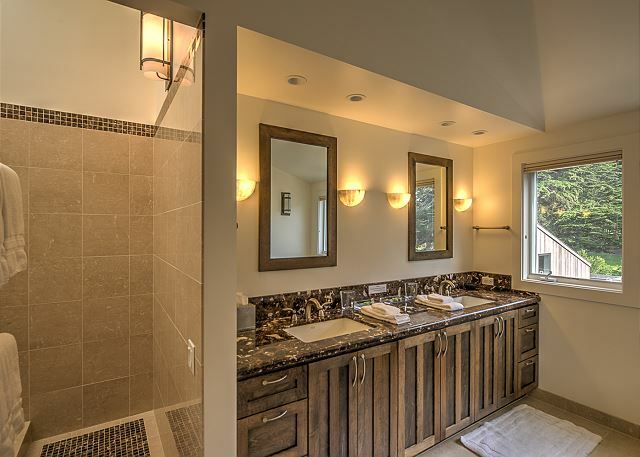 Quality finishes throughout with 3 separate bedroom suites, each with their own bathroom. 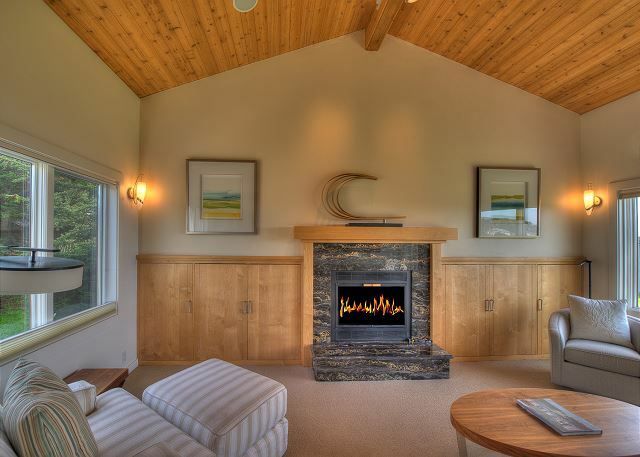 The master suite has a king size bed and a separate sitting room with fireplace, 42 " flat screen TV and bar area. 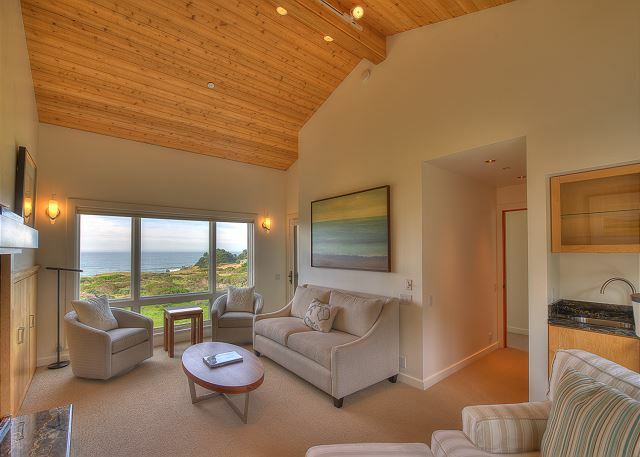 Both rooms have fantastic views of the Arch Rock. 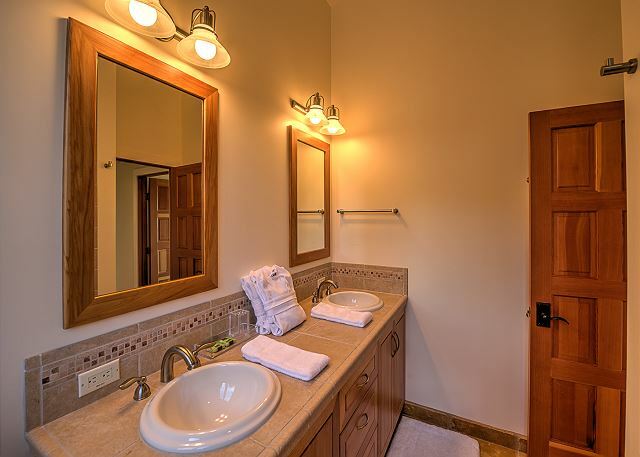 The newly remodeled artist retreat is a detached building on the ground level, with a king bed, fireplace and 55" flat screen TV. The 3rd living area is a wing of the house on the first floor that includes a queen bedroom, a 2nd room with a Murphy bed and a door that separates the rooms from the main living area. 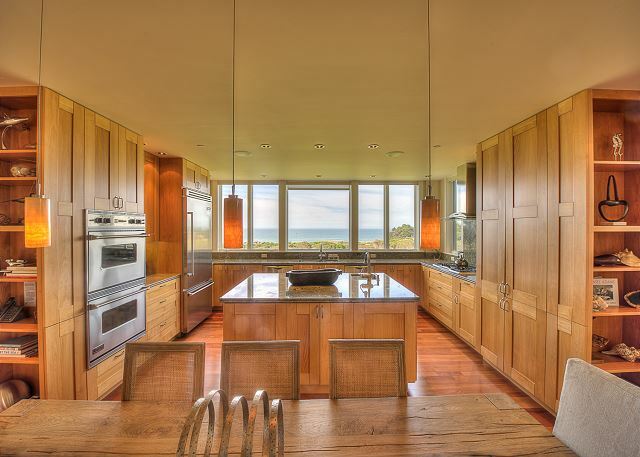 The kitchen has gourmet style appliances, a large island and sweeping views of the ocean. 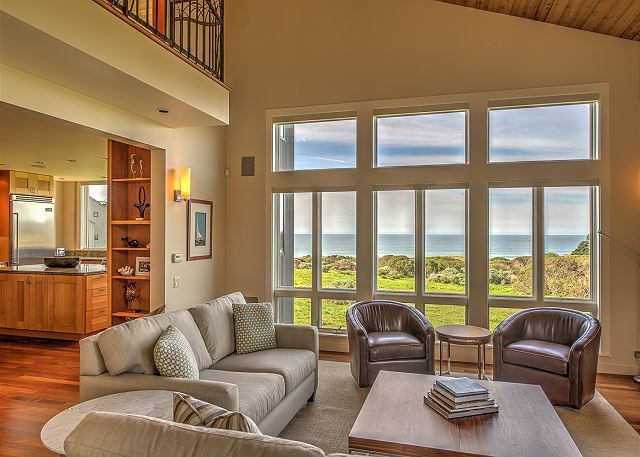 The spacious living room looks out at the ocean on one side, and the beautiful garden on the other. Unsurpassed outdoor living spaces include ocean view decks and a private courtyard with a waterfall and built in outdoor kitchen for grilling. Great house with great views! Sea Rock was exceptionally clean and cared-for. Thank you to Beach Rentals for excellent service! This house is perfect. The location is great. The house is so lovely and the kitchen is so well equipped. Everything was super clean and accommodating. I would love to return. It's an amazing vacation house. We have rented this home twice and found it to be exceptional. The location near the lodge and Ohlsson pool makes for wonderful walks from the bluff trails. The home itself is beautifully furnished and very well appointed. Amazing water views from. The home includes 2 master bed suites and a nice queen room and room with a good full size Murphy bed. Great for a family or other group of up to 7 people. We had a very fun and relaxing trip. We shared the home with another couple and their daughter. It worked out perfect. We had the private artist cottage and they took the master bedroom and queen bedroom in the main house. The kitchen is perfect for cooking at home and my husband said the outside grill worked perfectly. The home is well appointed and had everything we needed. This home is both comfortable and well-appointed. We had a bit of a problem with the ovens and the management company was very helpful. The whole experience was wonderful. We had a wonderful time at Sea Rock. 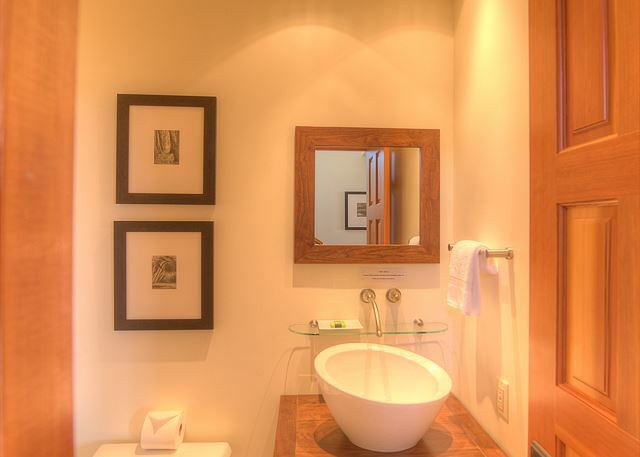 It's wonderfully furnished and great little touches that make it a really nive place to stay. Such a beautiful home with great space to hold 8 people comfortably. 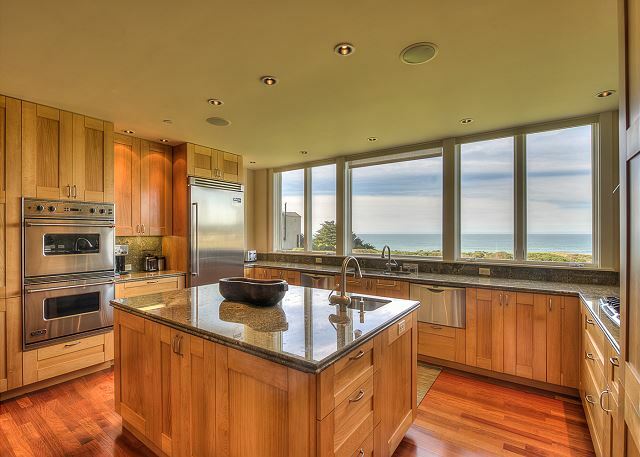 Beautiful kitchen with great ocean view. All bedrooms have beautiful views as well and the patio BBQ is a great bonus. Such abundance and comfort! We look forward to our next visit! We stayed at Sea Rock for the 3-day MLK weekend. It worked perfectly for our extended family of six adults and a 1-year old. Beautiful home, large, and comfortable. 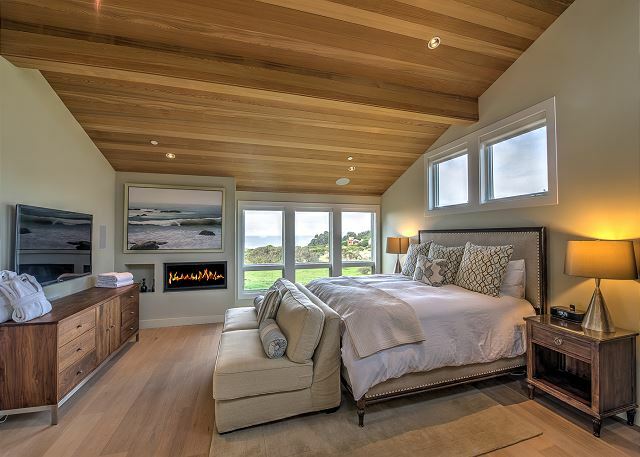 Amazing master suite! Couldn't have been nicer. Marvelous place to stay. Our favorite place to stay for our annual family getaway. Couldn't be more pleased with Sea Rock home or Beach Rentals. We will be back next year. Thank you! Beautiful home with lots of room for family with kids in main house and an extra private suite for another couple such as uncle and aunt. Very comfortable with good kitchen. Great hot tub. We had a wonderful time while at Sea Rock. In general the house exceeded our expectations. We appreciated how well stock was the kitchen. We were disappointed one of the dishwashers was not working and it was not resolved even thou we were there 8 nights. Also the fan for the BBQ was not working and when you open the door to the house the smoke alarm will sound. The Artist Retreat was very nice, but there was no remote for the fire place. In spite of the few inconveniences I am planning to return to Sea Rock. As always are visit to sea ranch is a very special outing for the DeRosa family. weather this year was spectacular but the ocean visibillity was very poor. The searanch house we rented ( Sea Rock) was one of the nicest home we have stayed in are 35 years of going to searanch. This house is stunning. All of the rooms were so clean and nicely decorated AND super comfortable for lounging around and gazing at the ocean. I came here with my family for a wedding and it was just perfect-- easy to hang out together in the shared spaces, but privacy when you want it. I wish we could have stayed indefinitely! Very well-stocked kitchen, great views, great location. The water heater circulation pump started leaking the day after we arrived and the management company had a plumber on site to fix the problem within an hour of our contacting them. Great vacation rental experience at Sea Rock. 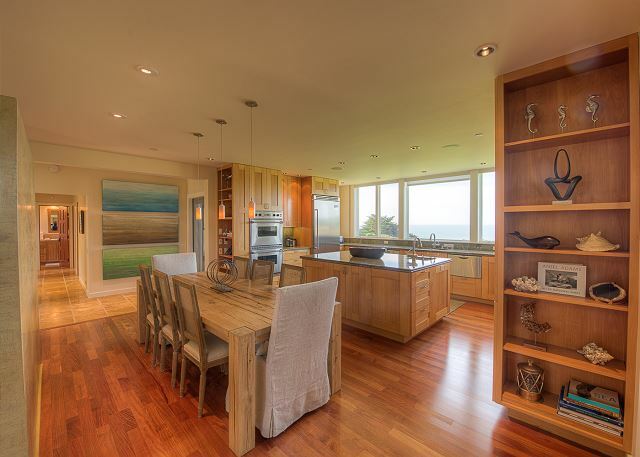 Beautiful, well appointed ocean meadow home. So many places to relax and unwind, read a book, play a board game or just enjoy the view. Great cooking kitchen, and great large home for family and friends. Loved the extra guest house! Our whole family enjoyed this house. It has an ideal location and is furnished beautifully. The deer came to visit every morning. 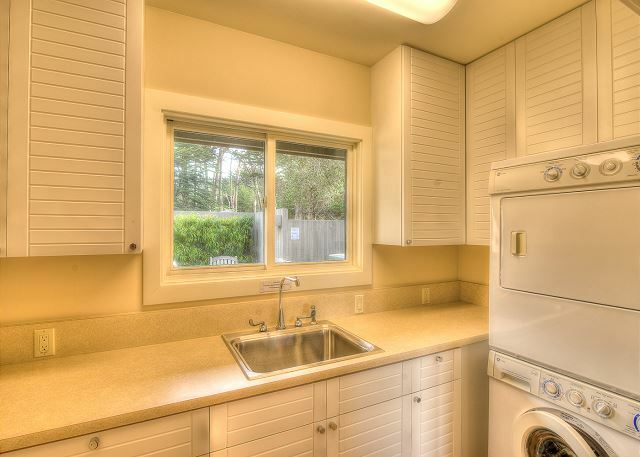 The kitchen has everything you could possibly want. We so enjoyed our stay at Sea Rock, can't think of anything to complain about so I'll just sing it's praises. Stunning setting, I keep looking out my kitchen window back home now... where's the Pacific?! The kitchen, extremely well stocked... the beds, dreamy... the common areas, beautiful. It Was Perfect. Thank you for a marvelous stay, we so enjoyed our family reunion. We had seven guest staying at Sea Rock. Between all of us, we couldn't come up with one thing we didn't like or would change. The high end amenities where everything advertised, At one point we thought we had a problem with the dishwasher, but it quickly started working. Everything was clean and in it's place. The kitchen was so well stocked, we weren't wanting for anything. The view from every room was spectacular. The staff in the office was very friendly and accommodating. I just can't say enough good things about Sea Rock. We hope to be back next year. The ambiance, accommodations and quality of Sea Rock is top notch. This is a great home for a group of folks or couples. 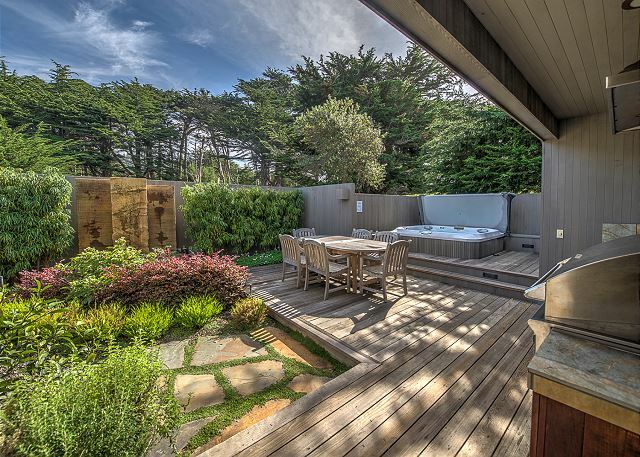 It is close to the ocean and other Sea Ranch amenities. This house was beyond our expectations. Even though the pictures make it look nice, it was better in person. It had so much space- plenty for 7 of us. Everything was decorated so nicely and amenities were great. We will definitely rent again. The only thing is that the locks are tricky and we had to drive past the house to get the keys at the office. Why not get programmable locks so you can change often but allow people to go right to the house. That would be so much easier after driving far - the last thing you want to do is pass it to get the key. It was a wonderful weekend, a wonderful house and great time. A wonderful stay with family & friends that we will not soon forget! My wife, son, daughter-in-law, grandson and I enjoyed an amazing week at Sea Rock beginning Mar 27th. 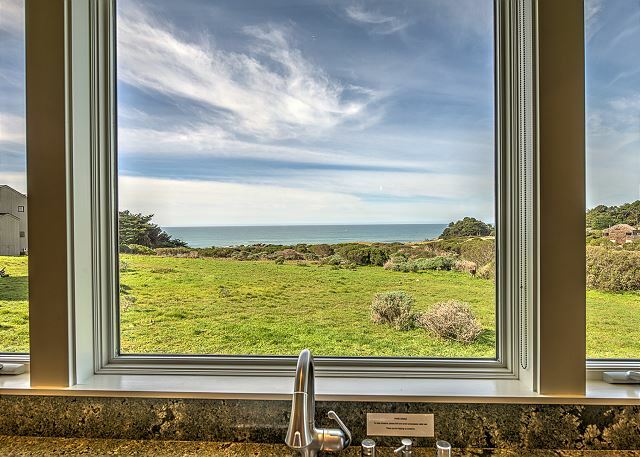 Sea Rock is a beautiful property with a wonderful view of the Pacific. With the exception of 2 amenities - the courtyard fountain and the stereo system - everything was operable. Those missing amenities explain why I didn't give the property 5 stars for condition. We would definitely stay there again. Thank you for your feedback. The house is equipped with a stereo in the living room that allows guests to use their Bluetooth capable advices (e.g., IPhones, IPads, androids, etc.) to play music through the speakers in the kitchen and back patio (if you select Zone 2 on the remote). You can also connect your devices directly to the front of the stereo receiver using a USB cable. We have placed a set of operating instructions for the stereo at the property below the TV in the living room. 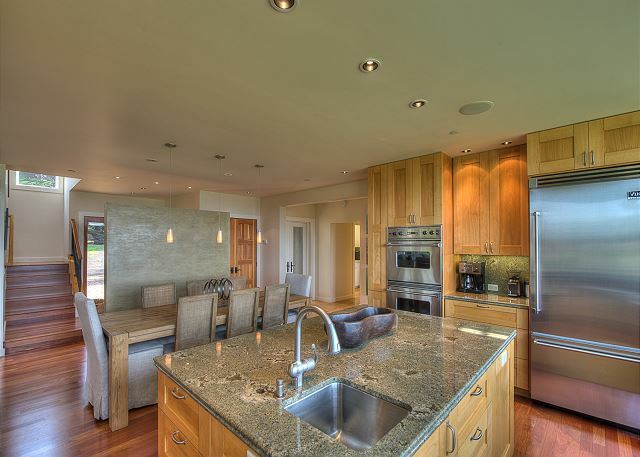 The fountain is controlled by a remote that is in the top drawer in the kitchen island. For safety reasons, the fountain is plugged into a GFCI plug and will occasionally trip during stormy weather. The plug can be easily reset at the plug in of the fountain. Unfortunately I was quite ill while there so wasn't able to really fully enjoy it but my friends thought it was fabulous! We loved the house and would like to book it again next year. Couple of small maintenance issues, Toilet seat in the guest house is loose, fireplace would not work in the guest house, fountain would not work in the entry way, carpet in the dining area rolls up make a trip hazard. Cob webs in the guest house. Other than the small items listed above we thought it was great and like I said earlier would love to book it again for the same dates next year. Thanks. We found our choice of vacation rental to exceed our expectations. 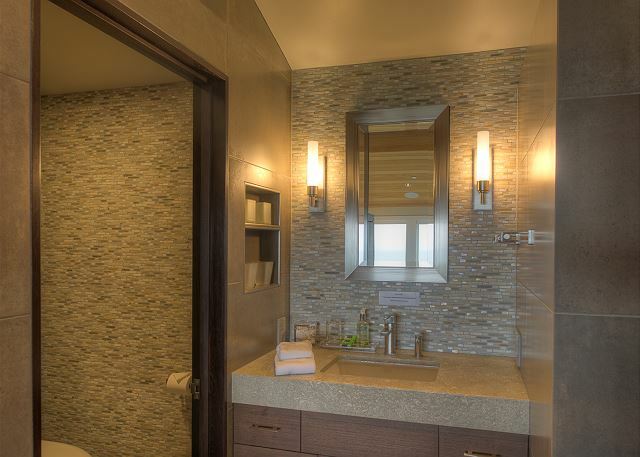 As an artist I greatly appreciate the architecture, the amazing views from all over, the design of the light fixtures, the entire master suite space and the wonderful kitchen we can all work in together because of the wonderful island. Great stay. Nosy neighbor. Couldn't lock the outside door to the guest house. Great location, beautiful house. Great Home. Neighbor to south not so great. We had a very relaxing weekend with family. We so much enjoyed our stay, except for the neighbor to the south. Complained about walking on the property from the trail. Called the security guard. Over-the-top nosy dude. We will stay there again though. 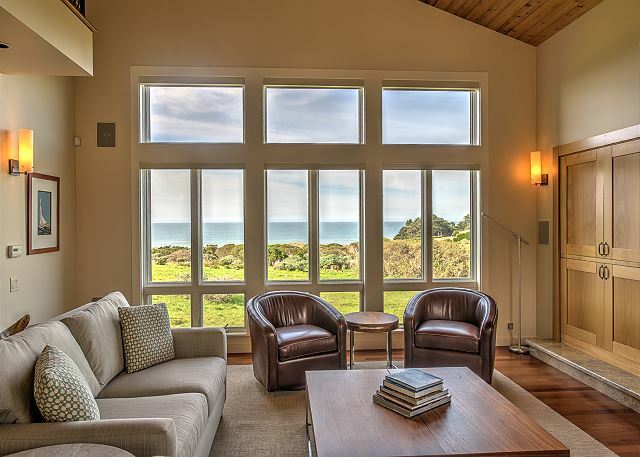 Nicest home we have stayed in so far in our 30+ years going up to the beautiful Sea Ranch. Thank you for passing along the feedback. We have added some information to the property on the best way to access the trails so future guests can avoid a similar issue. Outstanding ! We want to go back. The home is beautifully furnished and so comfortable. Everything was spotless - hurray for the housekeepers. Such a plus when renting. Anything we could possibly need to cook were in the drawers and cupboards. Shampoos and soaps included in the baths. Bring beach towels for the hot tub. The views were incredible and we had perfect weather for sunsets. I would highly recommend this property; my husband said he wants to come back next year. We loved everything and hated to leave. The weekend was excellent. We had gorgeous views, spectacular sunsets and a fabulous house to share with friends and family. Wish my home was as well designed...Relaxing to be in a home that I did not have to worry about cleaning, it was well planned for comfort, yet so luxurious. Our family has been reuniting at Sea Ranch over a period of 20 years and I can state, unequivocally, that Sea Rock is the most beautifully and efficiently designed home we've ever had. The kitchen/dining area is open, inviting, and meticulously laid out for ease of prep, cooking and serving. Whoever organized it is seriously gifted. Appliances are the best. The living room is really large, furnished beautifully and comfortably in neutral tones. Loved the window seat. Two bedrooms and bath on the first floor, great laundry area as well. The master suite is a haven that comprises the entire second floor, with a huge bath area, large sitting and entertainment room. 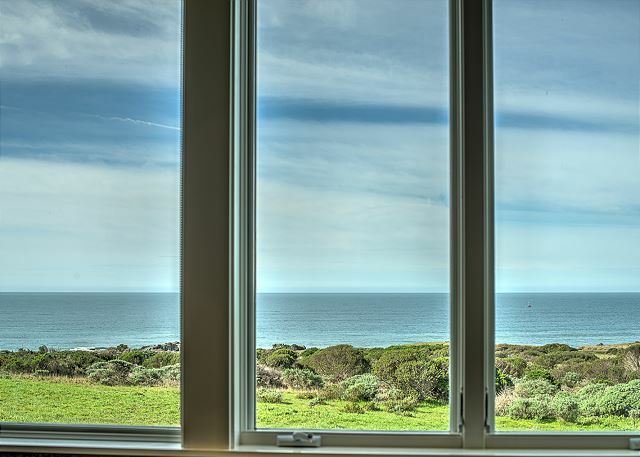 The bedroom itself has a gallery of windows that open to a view of the ocean that is breathtaking. The bed was so comfortable we sneaked a look at the manufacturer. The separate studio was a wonderfully designed contemporary space also with a maximum comfort bed and a contrast of darker wood with light walls and high ceilings. Beautiful. 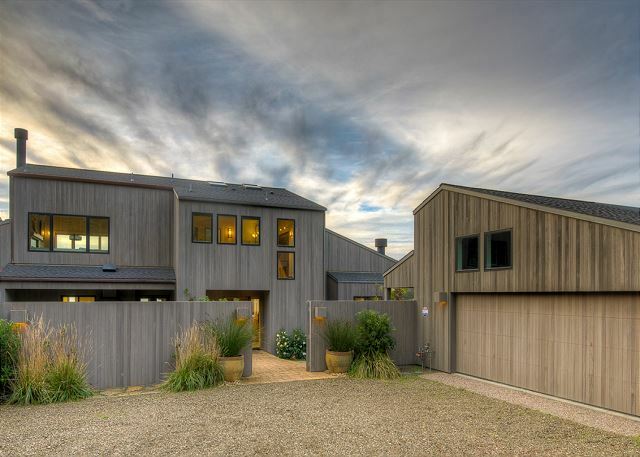 The landscaping is some of the most beautiful and practical we've seen at Sea Ranch. All drought resistant with stones and rocks and sculptures giving it a very Zen feel.The garden patio area is located in the front so there's never a problem with wind and plenty of seating for eating and just relaxing. The hot tub is larger than most. The whole effect is warm and intimate. 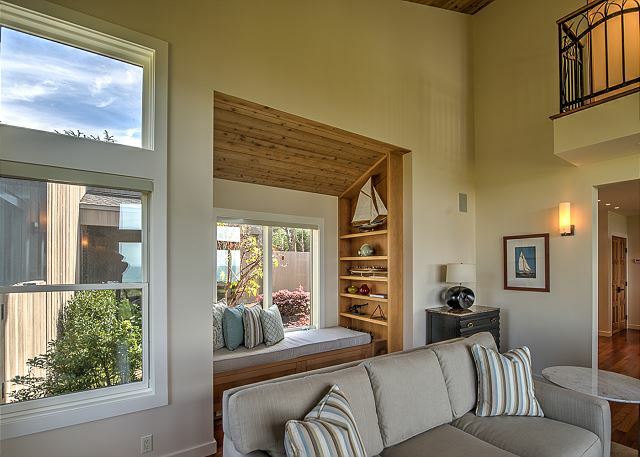 At the back of the house is a great seating area with a wide open expanse of the ocean, and at night, the stars. We all fell in love with Sea Rock. I wanted to add the home was pristine when we arrived and fuelly equipped with thick towels, robes and most household items you might need. The rental agents were personable and quite helpful. calm. If we return to Sea Ranch it has to be there. Great Sea Ranch vacation. House was wonderful for a family of 6 adults. Location, view from all rooms. The bq and patio area was great. Modern home with exceptional high end furnishings.